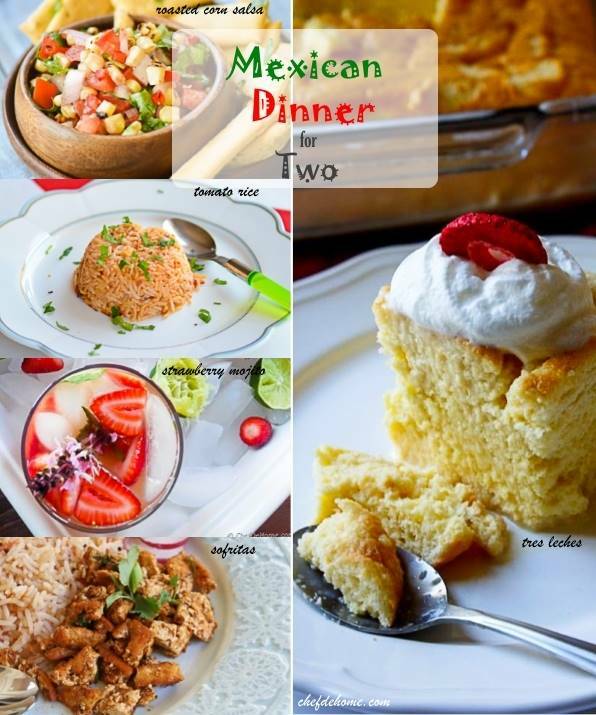 In "dinner for two" series, today, I'm sharing with you Mexican Fiesta dinner for two! This three course dinner comes with promise of a flavorful trip to "Mexican flavor town"! Make this dinner for your loved one for a romantic evening at home! Be it Valentine's day, anniversary celebration, or just Saturday evening, this zesty and spicy dinner can be wonderful way to say "I love you!" 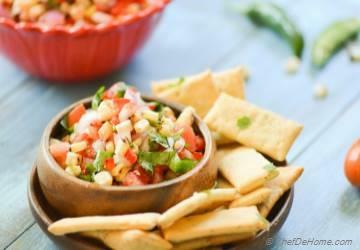 Start with a bowl of Roasted Corn Salsa and chips!! 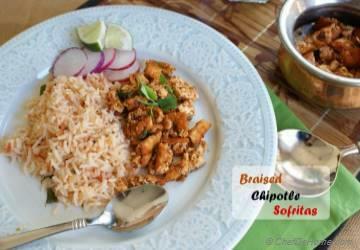 Serve Chipotle Tofu Sofritas with zesty Tomato Rice on the side. 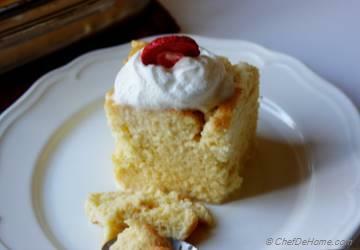 Finish with slice of milk soaked moist Tres Leches cake. 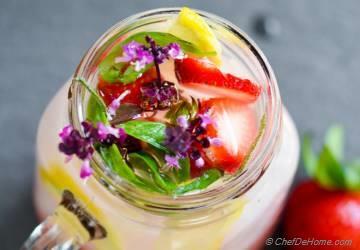 And don't forget to serve refreshing Strawberry Basil Mojito! All recipes can be made ahead! So.... no need to stress, simply make ahead, sit back, relax and enjoy dinner with your loved one! thanks, @Padma! Mexican food is everyone's favorite! always so flavorful and vibrant! isn't it?? I'm so glad you like this meal too! Happy to see you stopping by! have a great day! Sure!! Manali, you are welcome any day! I would love cooking a Mexican feast for you! Thanks a ton for liking the series. Love to see you around! Thank you so much dear Neeli! Bryan, anytime!! I am happy to share this series with you all! I am glad you like my chipotle sofritas and many thanks for stopping by! Medha, thank you! 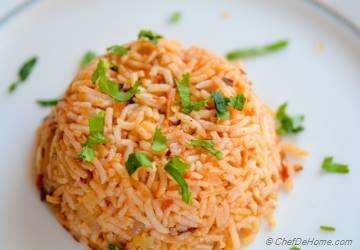 I bet you will fall in love with sofritas and rice asap! :) thank you so much for stopping by! I love mexican food and your chipotle sofritas is the reason I know you!! thanks you for this dinner for two series! Perfect dinner for two idea, Savita!